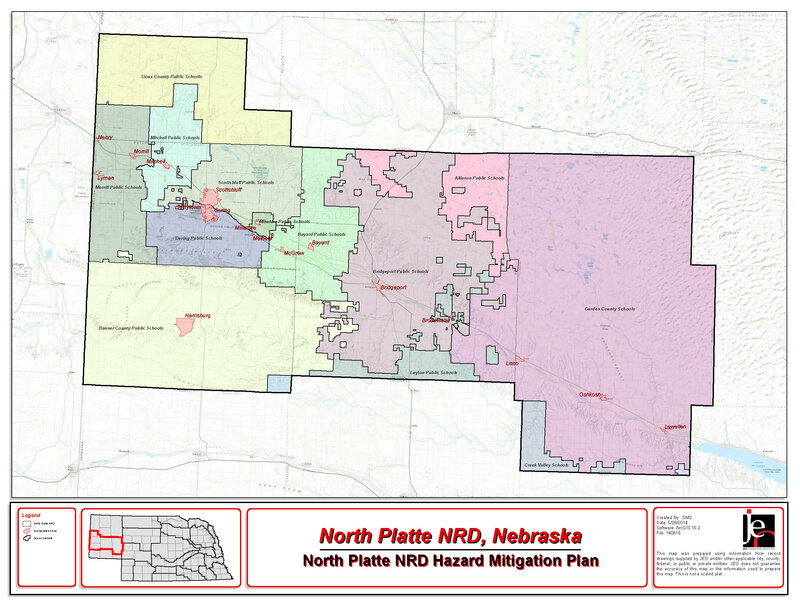 The primary objective of this project is to update the 2011 Multi-Jurisdictional Hazard Mitigation Plan (HMP) for the North Platte Natural Resource District (NRD) Hazard Mitigation Plan, which is a community-guided document that identifies both vulnerability to natural and man-made hazards, and mitigation measures to reduce or eliminate this vulnerability. Hazard mitigation plans are a requirement of the Disaster Mitigation Act of 2000, administered by the Federal Emergency Management Agency (FEMA). Once a community, NRD, or county is part of a plan, they become eligible to apply for pre- and post-disaster mitigation grants, which are available on an annual basis as appropriated by congress. These federal grants allow for up to a 75% cost share for a wide variety of projects listed in the plan. The NRD’s existing HMP was approved by FEMA on July 5, 2011. FEMA requires that the HMP must be updated and approved within a five year period. The NRD-wide plan includes hazard assessments for all eligible participants within the planning area. The eligible participants will include: counties, cities, villages, school districts, colleges, rural water districts, etc. The figure below illustrates the potential eligible jurisdictional boundaries for this plan. This hazard mitigation plan update is funded by a FEMA planning grant. The cost share is 75% federal funding and 25% local match. For this plan update, the North Platte NRD is providing the 25% local match. The 2016 North Platte NRD Hazard Mitigation Plan has been approved pending adoption by FEMA! Thanks to all who participated in the planning process! Please contact Brooke Welsh at JEO to submit any adoption resolutions: bwelsh@jeo.com or 402-474-8741.